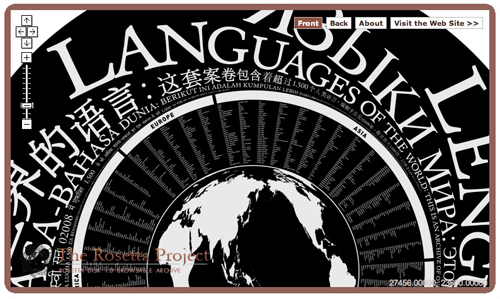 A fully browseable version of the Rosetta Disk is now available online at The Rosetta Project website. Using this link, you can virtually browse and explore the contents of the disk, just as you would if you were looking at the micro-etched Rosetta Disk with a high-powered microscope. The viewer for the digital version of the Rosetta Disk on this DVD was built by Kurt Bollacker, using the OpenLayers 2.5 map visualization framework. The browseable Rosetta Disk is temporarily replacing the content of the previous Rosetta Archive site, while we build out a new architecture for Rosetta that will make it much easier to access, use and repurpose Rosetta Data. Our new site is still under wraps, but we are very pleased to say that its distributed architecture involves both the Internet Archive — a caretaker for one of the original Rosetta Disks — and the open database site Freebase. Meanwhile all Rosetta data is safe, sound, and continues to be backed up by Stanford University Libraries. Stay tuned for more on this channel, and meanwhile, happy disk browsing!